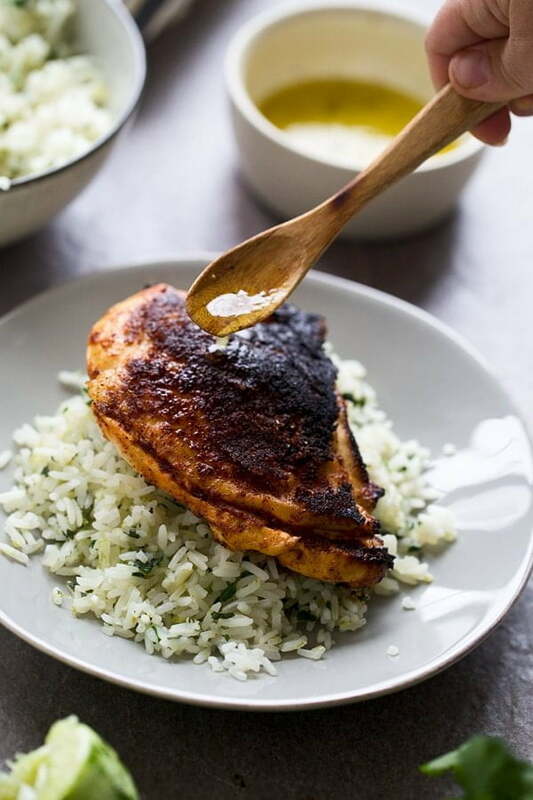 Packed with garlic, lime and plenty of spices, this Chile and Lime Crusted Chicken with Garlicky Cilantro Rice is an easy way to update your average chicken and rice meal. Sure to be a new family staple! Chicken and rice is one of those staples people all over the world come back to again and again when it comes to family dinners. 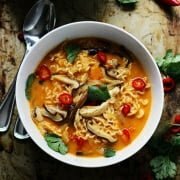 Whether it’s the chicken and rice casserole with cream of mushroom soup your Mom made growing up in the US, Arroz con Pollo in Latin America or Chicken Biryani in India, chicken and rice seems to be a meal that brings families all over the world together. 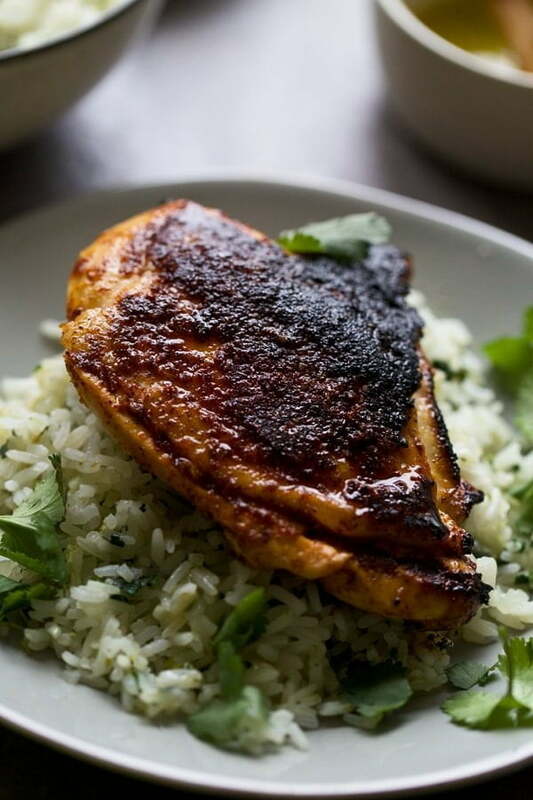 I’m guessing I make some variation of chicken and rice at least once a week, sometimes without even realizing it, which is exactly what happened with this Chile and Lime Crusted Chicken. 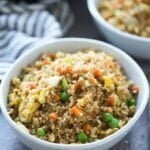 Even as I went through the pictures and picked ones out to edit while simultaneously reliving the perfect balance of seasoned chicken to flavorful rice ratio, it didn’t dawn on me that this could be our new favorite way to eat the classic combination. 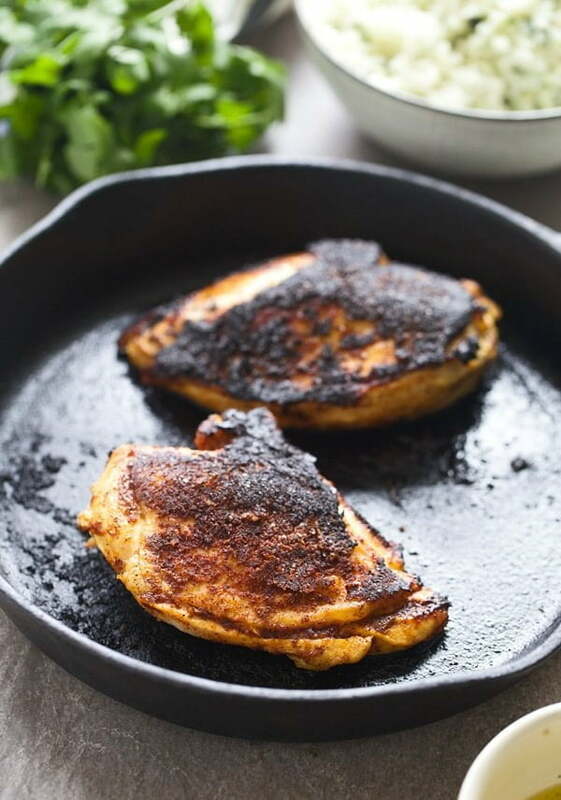 Chicken breasts are marinated in a seasoning mix of lime juice, lime zest, garlic and olive oil, then coated in what is essentially a blackening season mix, and seared in a screaming hot cast-iron skillet. 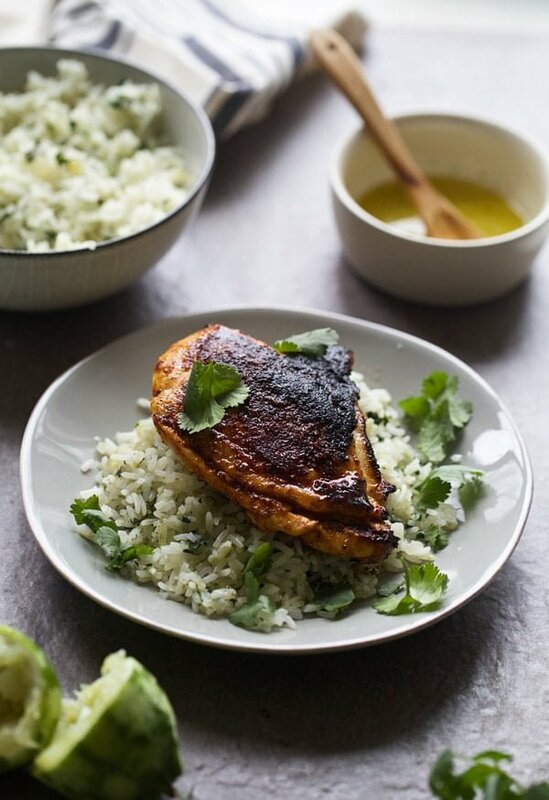 The chicken is nestled on top of garlicky cilantro rice (where the juices of the chicken will eventually seep down to) and then drizzled with a super quick and easy lime vinaigrette. 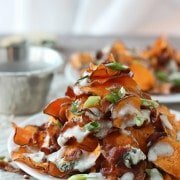 It’s crazy flavorful with its notes of chili powder, smoked paprika and garlic, slightly acidic with the addition of lime juice, and the perfect balance of protein to carbs in one bite. I’m smitten. Because bone-in chicken breasts typically don’t dry out and pack a little bit more flavor than its boneless counterpart, that’s what I went with, but you could easily use boneless skinless breasts or even chicken thighs if that’s your preference. First things first, the marinade. It’s simple, three ingredients – lime juice, garlic and olive oil – go into a zip lock baggie along with the chicken. It’s sealed shut and then massaged into the flesh of the chicken. I typically let it rest for at least three to four hours in the fridge, but you can even leave it up to eight hours. I wouldn’t leave it much longer than that since the acid of the lime juice starts to cook the chicken. Once the chicken is marinated, it’s dried with some paper towels and generously coated in a seasoning mix of chili powder, paprika, smoked paprika, onion powder and plenty of salt. 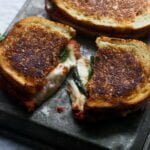 It’s essentially blackened in a cast-iron skillet (you could also use a regular sauté pan) and then finished off in the oven. Because I’m all about efficiency in the kitchen, while the chicken cooks, the rice does its thing as well. 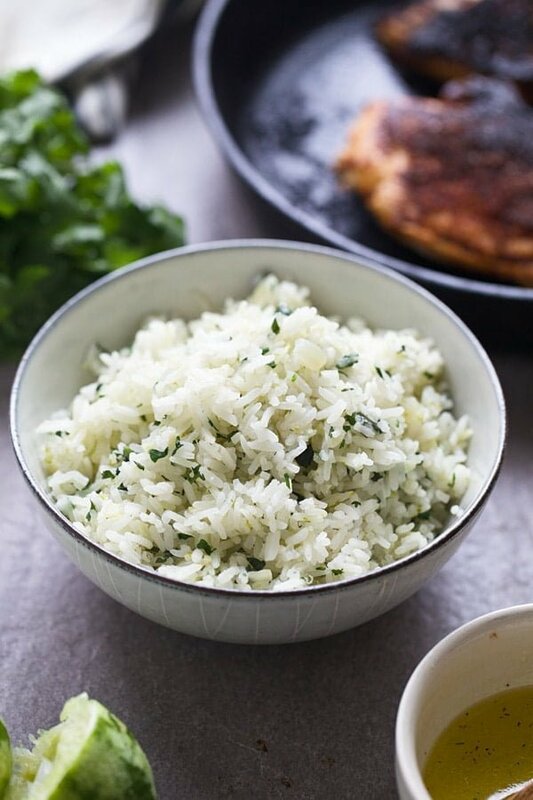 While simple in its ingredients list, the rice packs a ton of flavor due to copious amounts of onion and garlic, and later, a generous amount of bright lime zest and cilantro. 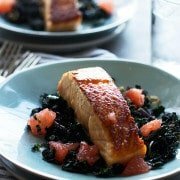 You don’t necessarily want to “cook” the lime zest and cilantro, so make sure to add both of those ingredients at the very end, right before serving. 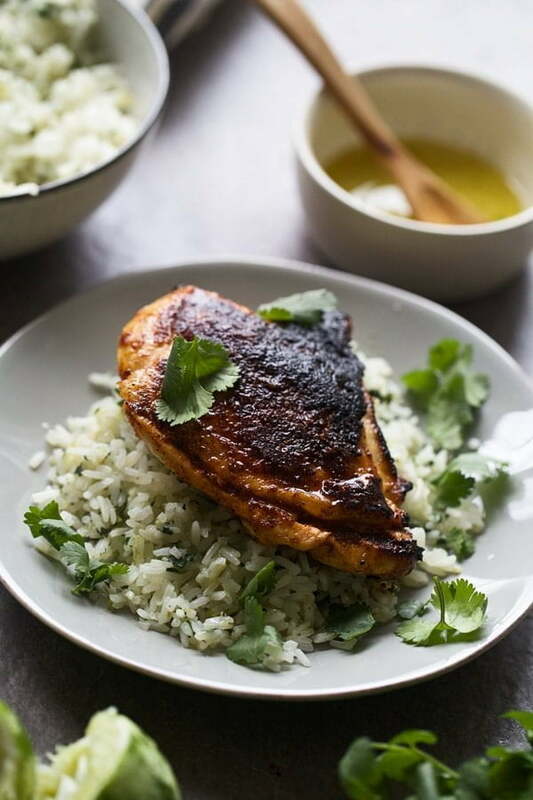 A final punch of flavor is added at the very end when the chicken and rice is drizzled with an easy lime juice and honey vinaigrette and sprinkled with a little bit more cilantro. Using a sharp knife, remove the rib bone of the chicken breast. If you need help, refer to this tutorial. Add lime juice, grated garlic cloves, and olive oil to a large plastic bag. Mix together and then add chicken breasts. Marinate for 45 minutes to one hour. Preheat oven to 375 degrees. Once the chicken has marinated, use paper towels to completely dry off the chicken. Set aside. In a small bowl, combine lime zest, chili powder, smoked paprika, paprika, onion powder and salt. Sprinkle evenly over chicken. 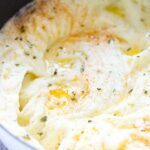 Heat a large cast iron skillet to a medium-high heat. Add olive oil. Coat pan in olive oil and place chicken skin-side down. Cook until skin is crispy and crust has formed, about 5-6 minutes. The chicken should easily release from the pan. It may look burnt, but it's not! It's just blackened. Flip the chicken and place in the oven. Cook until the internal temperature reaches 165 degrees. Let rest for five minutes before serving. Serve rice with chicken. Spoon vinaigrette on top. Once all the water has evaporated, fluff the rice with a fork and add lime zest and cilantro. Season to taste with salt. Whisk lime juice and honey together. Slowly drizzle in olive oil while whisking. Season to taste with salt and pepper.